Mr. Quinto was born and educated in the Philippines, where he received a Bachelor of Science in Marketing from San Beda College in Manila, Philippines. He also graduated from the Minority Business Executive Programs of the Tuck School of Business at Dartmouth in Hanover, New Hampshire. Mr. Quinto now resides with his wife Carlyn and daughter Carlette in Palos Verdes, California. Mr. Quinto’s contributions to the advancement of the API community are many. He began his professional career in California in 1984 as a mortgage banker. As a publisher, his weekly newspaper advances the interests of the API community and appropriately addresses local, consumer and business news, and community events. He is also a member of several community organizations. These include the Los Angeles Minority Business Opportunity Committee and The Greenlining Coalition. His contributions have been widely recognized. Mr. Quinto is the recipient of the Award for Excellence in Journalism during the Fourth Annual Asian Pacific Islander Heritage Awards in celebration of the Asian Pacific Islander American Heritage Month. This award recognizes prominent APIs that have excelled in bringing pertinent news to the API community. 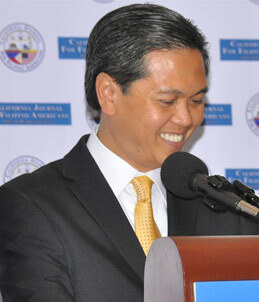 He previously was listed among the Star Suppliers of the Year of the Southern California Regional Purchasing Council in 1999, received the Minority Media Award from the U.S. Small Business Administration in 1997, and has also earned a leadership award from the Filipino American Chamber of Commerce based in Los Angeles.